As digital devices become more common in classrooms, teachers and students are discovering that what worked in the analog world may not be as effective in the digital one. Nowhere is this more clear than with note taking, a long-standing and important practice in most classrooms. For this reason, few empirical studies may be more detrimental to encouraging the use of technology in education than Mueller and Oppenheimer’s (2014) "The Pen is Mightier than the Keyboard" as well as Carter, Greenberg and Walker’s (2016) "Effect of Computer Usage on Academic Performance." Both studies claim that students in lecture-style courses perform worse on assessments when allowed to use devices for note taking. When note taking serves as the primary use of technology in the classroom, these studies become a harbinger for technology opposition. University professors have used these data as a rallying cry to ban laptops in their classes, and K-12 teachers have cited these studies in arguments against 1:1 programs in schools. However, none of these studies question the teaching methods used in the classes themselves or whether teachers are recognizing the power of digital devices for students to create, share, connect and discover information. The researchers behind these studies acknowledge that the act of note taking can be beneficial to student learning when used to summarize, synthesize, or draw conclusions; they also argue that it is not helpful when used to capture content verbatim -- a practice that often happens when typing on a laptop. While both of these studies make wide generalizations about the detrimental impact of technology on education, neither offers any recommendations, such as those presented below, to help students take advantage of all the ways their devices could actually improve their ability to organize, make connections and synthesize information. Organization is a critical academic skill and one that many students struggle with in both the physical and digital worlds. Parents and teachers already help students get organized and now need to extend that to the digital world. Given the influx of technology in their academic lives, students need to develop an effective organizational system for their digital notes, projects and thinking. Much like students understand the concept of binders, notebooks and notes in the physical world, they need a similar system in the digital one. Whether working with dividers and subjects in a tool like Notability or sections and pages in OneNote, students need to build vocabulary to support how they house their learning. All note taking tools search typed content, and many also search handwriting, so students can not only find information quickly, but they can also focus on making connections to previous ideas instead of wondering where they put their notes. These familiar paradigms allow students to digitize existing organizational processes, but then add powerful capabilities such as searching and tagging. Through thoughtful tagging, students can easily search across their notes, regardless of where they might be digitally organized. Traditionally, students and teachers may think of tags like keywords. Students in a history course might tag content by event (e.g. Civil War or Treaty of Versailles). And yet, content could also be tagged with study strategies, overarching themes or essential questions debated in class. When teachers build this type of critical thinking into note taking instruction, they can help students to engage more deeply with their notes. Tagging this way not only helps students stay organized, but it could also help them to examine trends across courses or even semesters. As a doctoral student, I use OneNote. First, I create a new digital notebook each year. Inside that, I add sections for each term as well as my different courses. Finally, my notes get organized into individual pages within the sections. When I can recall the precise location where I put a particular set of notes, I navigate directly to that page. However, on the numerous occasions when an author, vocabulary term or concept seems familiar but I cannot recall the precise moment when I took notes, then the search function becomes critical. Since I can search across sections and notebooks to quickly access content, I have more time and mental capacity to connect seemingly disparate pieces of content and engage in a deeper synthesis of ideas. This is exactly the type of thinking that Mueller and Oppenheimer advocated for in their paper, "The Pen is Mightier than the Keyboard." However, they argued that this was the main benefit of taking notes by hand instead of recognizing it as a strategy regardless of device. Students may take notes on paper, add photos of those papers into a digital notebook, synthesize their thinking with audio or written notes, and then tag their digital notes for later retrieval. Students might use audio syncing -- a feature that records audio and then digitally syncs it with whatever the student writes or types -- to capture the context of the class discussion or lecture. When reviewing their notes, students could click or tap on their notes and then jump directly to that point in the audio recording. Teachers might provide students with their presentation slides or other note taking guides as PDF files. Now, students can focus on taking notes — using any modality — for synthesis, elaboration, reflection or analysis rather than in an attempt to capture content verbatim. 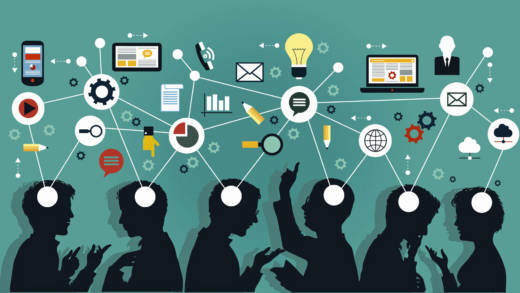 In 1949, neuropsychologist Donald Hebb famously wrote, “Neurons that fire together wire together.” When scaffolded for students, digital note taking has the power to transcend the traditional definition of what has been typically considered “notes.” By encouraging students to focus their note taking on building deeper connections instead of just capturing content verbatim, then they create a more integrated neural network around the ideas. With the right support from teachers, digital note taking can be so much more than just capturing a lesson. It can encourage students to actively engage in the note taking process and also reflect on their own development as learners. They might even tag their notes as such! According to Johns Hopkins professor Mariale Hardiman, concept mapping helps students to build deeper connections, more easily recognize links between content elements, and increase their conceptual understanding of the topic. She compares providing a concept map to students with using the picture on the box of a jigsaw puzzle -- it’s the “big picture” for how seemingly disconnected pieces of information fit together. Teachers can offer concept maps at the beginning of a unit as a way to frame the learning, but students can also make their own concept maps to visualize connections across content areas through diagrams or sketch notes. One of the powerful components of digital note taking is that the pages never end, and a full page isn’t an artificial barrier to limit thinking. Students can work on an infinitely expanding canvas to include as much information as they need. For example, concept mapping tools such as Coggle or Padlet allow students to create networks of ideas using text, links, images and even video without ever running out of room. An ever-expanding canvas removes all physical constraints on students’ thinking and connecting ideas. To illustrate this concept, Sabba Quidwai, former director of innovative learning for the physician assistant program at USC's medical school and now K-12 development executive at Apple, shared the image below from an anatomy student. 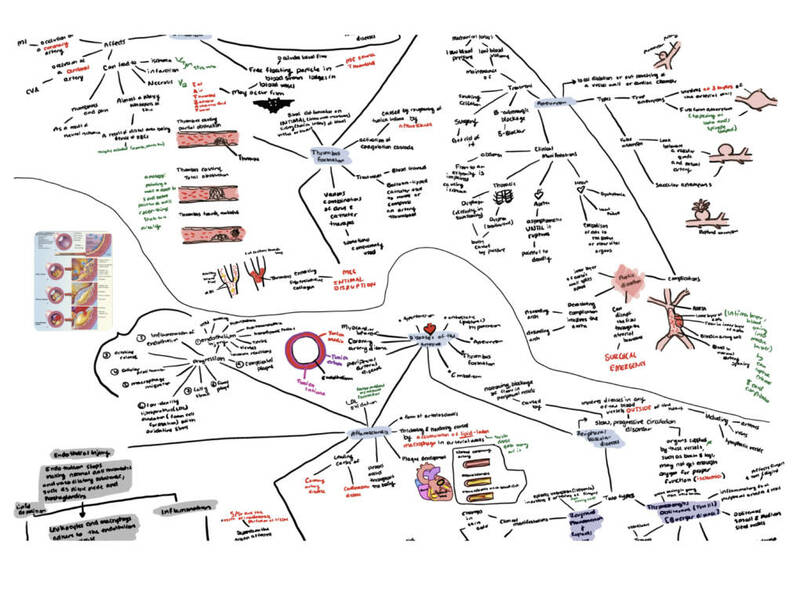 The student constructed a concept map in Notability using sketches, screen shots and handwriting to illustrate key points about the circulatory system. Finally, students of all ages struggle to make connections to the content as they read and write, regardless of the note taking medium. Whether asking an elementary school student to pick out the main idea in a passage or a high school student to synthesize across multiple sources, all students need scaffolding for their thinking and reflection. Visible Thinking routines, sets of questions designed by researchers at Harvard’s Project Zero, encourage thinking and support student inquiry. Consider the potential of using See-Think-Wonder, one of those routines, to focus notes about a reading or a presentation. Instead of directing students to “take notes,” teachers could suggest that they create three columns on a page, or nodes on a concept map, and then take note of what they see, what they think, and what they wonder. Not only does this guide their note taking but it also encourages them to ask questions about the content as they record it. Similarly, students might use another routine, Connect-Extend-Challenge, to summarize notes at the end of the day and reflect on their learning. This thinking routine asks students to connect new content to prior knowledge, acknowledge what has extended or pushed their thinking in a new direction, and then address what they still find challenging or confusing. Whether completed on paper and then added to a digital notebook as a photo, or constructed completely digitally, visible thinking routines provide concrete strategies to help students engage with the information they are capturing. If teachers recognize the power of digital tools, and their responsibility to help students learn to use them, then digital note taking isn’t just “one more thing to do.” Instead, it becomes an important skill that could help students to engage with ideas, synthesize concepts and build the critical thinking skills that they will need to be successful learners in the future.